Bombay Shaving Company Beard Serum is a light smoothing beard serum to help detangle and treat frizzy beards while adding shine. It includes active ingredients that deep condition and protect your beard from everyday damage caused by dust, UV rays, heat and cold weather. 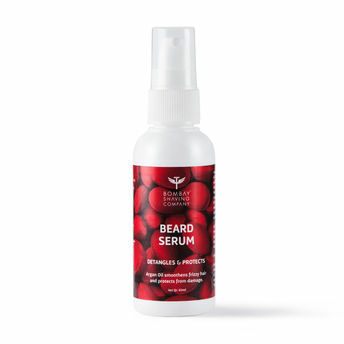 The beard serum features signature blend of citrus, woody notes: Bergamot, Sandalwood and Musk. Key Ingredients: Sunflower Oil, Argan Oil, Jojoba oil, Glycerine & Vitamin E.